The following is directed towards all those engaged in medical travel and have been following my blog for some time. Sorry I haven’t been writing in a while. I either did not see anything to write about, or just wasn’t in the mood. But the article below should be of extreme interest to all of you who deal with post-acute care and after care, even though you are not involved as of yet in workers’ comp. As the original focus of the blog was transforming workers’ comp, this should be read by those of you who have followed my ideas on the subject. Let me know what you think. NCCI, for those of you not familiar with them, is the organization responsible for collecting and distributing data about the American workers’ comp industry, what is driving the costs of comp, and of claims, and other financial data relevant to the industry’s function. This entry was posted in Health Care, Injured workers, Injury Management, Knee Replacement, Medical Tourism, Medical Travel, NCCI, orthopedic care, Orthopedics, Patient Outcomes, post-acute care, recovery of health and functioning, return to work, Surgery, Workers' Comp, Workers' Compensation and tagged Health Care, Medical Tourism, Medical Travel, NCCI, post-acute care, Workers' Comp, Workers' Compensation on December 5, 2018 by Transforming Workers' Comp. It is rare that I post articles from the National Council on Compensation Insurance (NCCI) on this blog, and it has been some time since I discussed workers’ comp and medical travel in the same post, so I thought that this would be a good time to do so. NCCI is the premier source for data collection in the workers’ compensation industry. Their focus is more involved with the factors that drive the cost of workers’ comp insurance, rather than specific issues in workers’ comp that one might find from reading the reports of the Workers’ Compensation Research Institute (WCRI). As the article will note, there has been a decrease in frequency of claims, but an increase in severity. Claim frequency is defined by NCCI as the number of claims involving lost wage benefits paid, divided by earned premium. For those of you in the health care and medical travel worlds, just know that it means there are more claims reported to insurance carriers. Claim severity, on the other hand, is defined as losses incurred, divided by the number of claims, for lost wage benefits paid. This will be of importance to the medical travel industry, as they have found a +16% increase in medical severity from 2011 to 2016. I will let you read the rest of the article here. This entry was posted in artificial intelligence, Automation, Average Medical Lost-Time Claim Severity, Claims, Claims Process, Data, Frequency, Health Care, Health Care Costs, Injured workers, Medical Tourism, Medical Travel, NCCI, Severity, Workers' Comp, Workers' Compensation and tagged Claims, Frequency, lost wage benefits, Medical Tourism, Medical Travel, NCCI, Severity, Workers' Comp, Workers' Compensation on September 26, 2018 by Transforming Workers' Comp. It’s May, and you know what that means. It means NCCI has held its Annual Issues Symposium, and the State of the Line Report, presented by Chief Actuary Kathy Antonello. 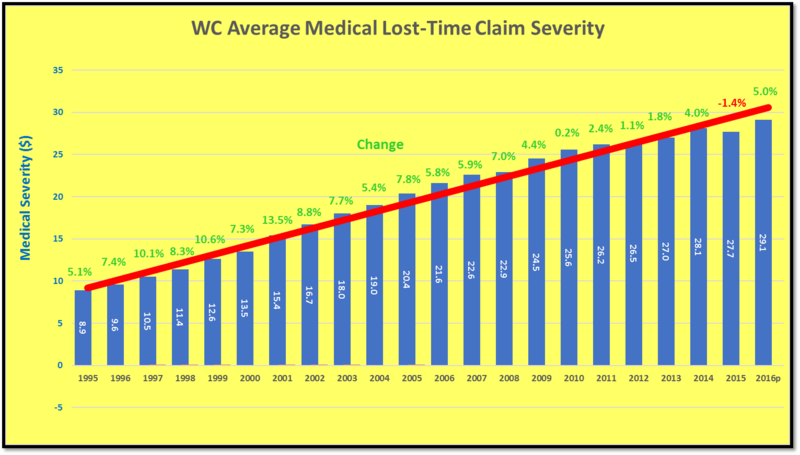 First up, this year’s WC Average Medical Lost-Time Claim Severity in Chart 1. As you can see, there has been another slight increase in the lost-time claim severity from the 2016 to 2017 preliminary data. In 2016, the average medical lost-time claim severity was $28,800 and the preliminary 2017 severity was $29,900, an increase of nearly $1,000. 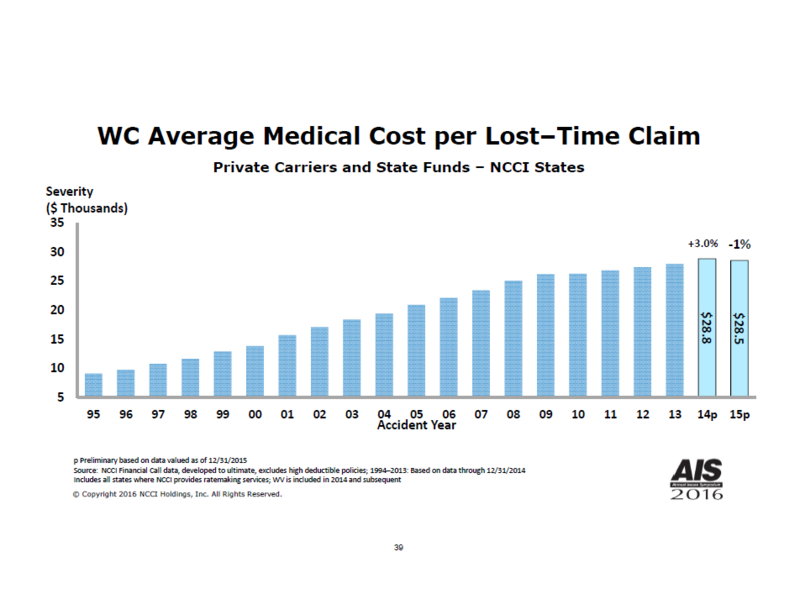 The key takeaway here is that NCCI estimates that the AY 2017 average medical lost-time claim severity is 4% higher than the corresponding AY 2016 value. Looking back at the data from last year’s report, we can compare the preliminary 2016 data with the actual 2016 data reported above. Chart 2 exhibits last year’s data. Source: NCCI’s Financial Call Data; p Preliminary based on data valued as of 12/31/2016. In chart 2, the preliminary medical lost-time claim severity was $29,100 and represented a 5.0% change from 2015. In 2015, it was $27,700 and saw a -1.4% change from the prior year. 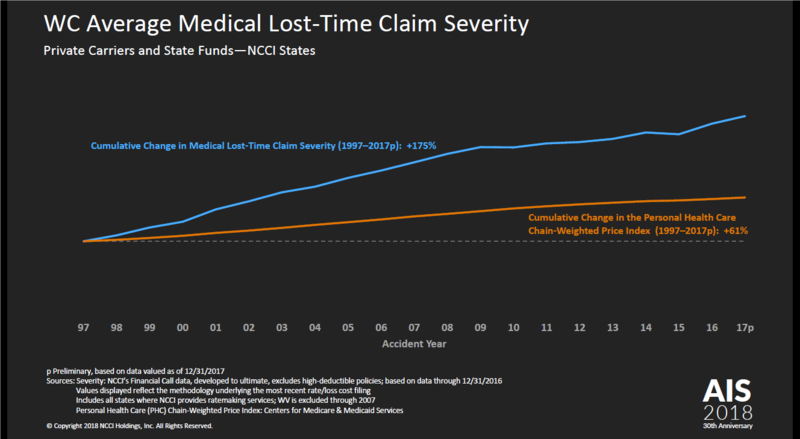 This is borne out in the next chart, Chart 3, where the 2015 average medical lost-time claim severity was estimated at $28,500, or a 1.0% change from 2014. Next, we look at the cumulative change in medical lost-time claim severity (1997-2017p), as highlighted in chart 4. In this chart, the cumulative change in medical lost-time claim severity is contrasted with the cumulative change in the Personal Health Care Chain-Weighted Price Index (1997-2017p). The PHC is a proxy for medical care price inflation that responds to changes in the blend of different medical services over time. From the chart, the cumulative change in medical lost-time claim severity has strongly outpaced the change in the PHC index in that same period, indicating that while the PHC index is nearly flat, the medical lost-time claim severity is rising and will continue to do so. According to NCCI, the medical lost-time claim costs have risen faster, +175% , than the PHC index of +61%, over the period from 1997-2017, with most of the gap occurring in the years before the recession. However, looking at the data from last year’s report, as shown in chart 5, the cumulative change in medical lost-time claim severity was much higher, as estimated by NCCI, which was +227%. Sources: NCCI’s Financial Call Data; Centers for Medicare & Medicaid Services ; p Preliminary based on data valued as of 12/31/2016. 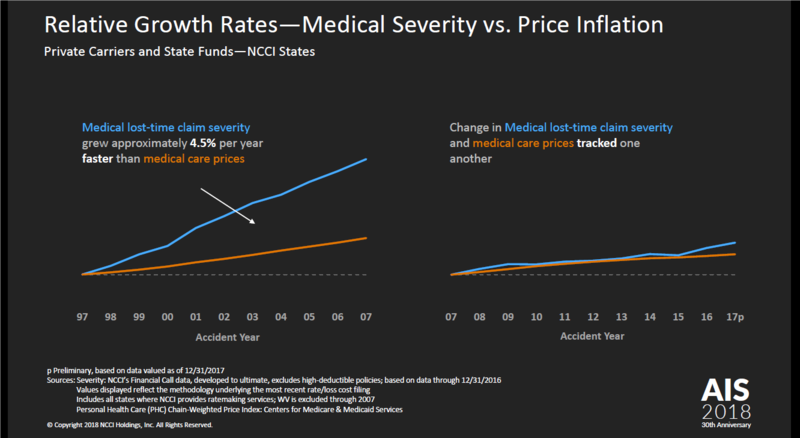 The next chart, chart 6, compares the relative growth rates between medical severity and price inflation. On the left-hand side, the medical lost-time claim severity grew approximately 4.5% per year faster than the medical care prices for the same period. On the right-hand side however, the change in the medical lost-time claim severity and the medical care price tracked one another in the same ten-year period. Yet, there is a slight rise in the medical lost-time claim severity after 2015 continuing into 2017. 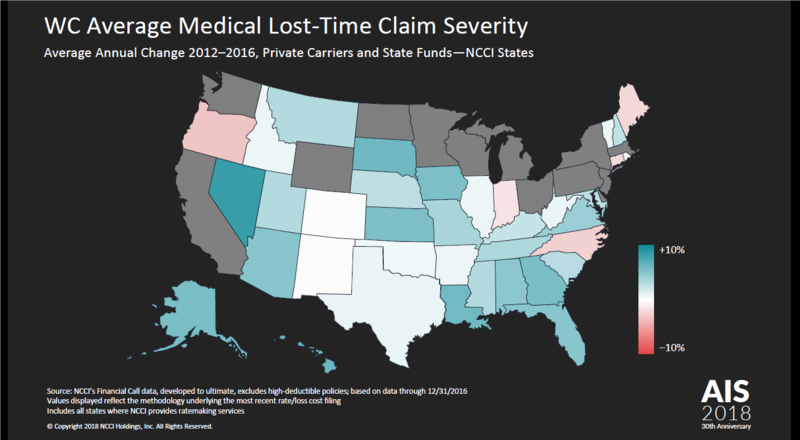 The key takeaways as NCCI reported were that much of the gap between the cumulative changes in medical lost-time claim severity and the PHC index since 1997 arose from the years prior to 2007. And that both the severity and care prices have grown at approximately the same rate, as indicated above. Lastly, the next chart, chart 7, indicates the average annual change from 2012 to 2016 for all NCCI states. Note: all states in grey are either monopolistic states or are intrastate-rated states that do not report data to NCCI. The state with the highest average annual change was Nevada, and the states with the lowest average annual change, were Maine, Massachusetts, North Carolina, Oregon, and Rhode Island. The key takeaways here are that the average annual change in medical lost-time claim severity was +2.3% from the four years between 2012 and 2016. The increase in Nevada, NCCI stated, was due to a very large claim that occurred in 2016. The decrease in North Carolina was due to a combination of large claim activity in 2012 and a change in the medical fee schedule in 2013 and 2015. But it is apparent that most states experienced a change at, or below 10% from 2012 to 2016. 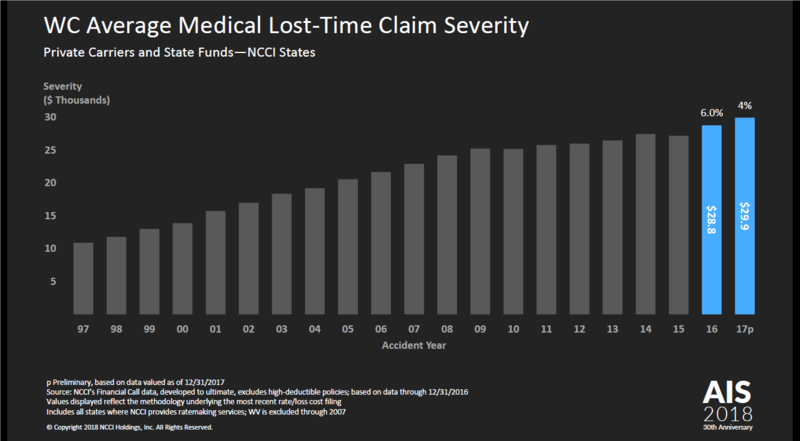 And if we are to believe that claim frequency is decreasing, then we must ask ourselves, why is the medical lost-time claim severity rising, as seen in chart 1, one hundred dollars short of $30,000. One answer we have already examined is the cumulative change in medical lost-time claim severity from 1997 to 2017, although preliminary as of this week’s report. However, what is not shown is what lies behind those numbers, i.e., what is happening in each claim to cause the severity to rise, or not rise. There is no indication, as there never is, as to what amount of the rise is due to the cost of surgery or to other claim factors such as hospital bills, ancillary services such as medical equipment, anesthesia services, any testing performed, etc. In short, we don’t know if what is causing health care costs generally to rise also is affecting the medical lost-time claim severity. As I have stated before in this blog, workers’ compensation must look to other alternatives to help bring down the medical lost-time claim severity. This cannot be achieved by looking between all three coasts. It must include looking at less expensive, but equally advanced medical care elsewhere. Otherwise, the gap will only get wider over time. This entry was posted in Average Medical Lost-Time Claim Severity, Claims, Claims Process, Data, MEDICAL COSTS, NCCI, Workers' Comp, Workers' Compensation and tagged Annual Issues Symposium, Average Medical Lost-Time Claim Severity, Claims, Costs, Health Care Costs, Medical Costs, Medical Price Inflation, NCCI, Personal Health Care Index, PHC, State of the Line, Workers' Comp, Workers' Compensation on May 18, 2018 by Transforming Workers' Comp. It is said, a picture is worth a thousand words, and I have ten pictures, courtesy of NCCI’s Barry Lipton’s presentation on that subject. It was brought to my attention by my fellow blogger, James Moore, of J&L Risk Management Consultants. I met James back in February at the NCCI 2017 Data Education Program in West Palm Beach. Yesterday’s posts regarding the slight increase in the average medical costs for lost-time claims only scratched the surface of the subject. I hope this post will dive deeper into it, so that we can see the whole picture. In my first post from yesterday, “Slight Increase in Average Medical Costs for Lost-Time Claims, Part 1”, I discussed how physician costs and prescription drug costs impacted medical costs for lost-time claims. On the issue of physician costs, Mr. Lipton showed that there was a decline in the 2015 medical payments per claim due to physician costs, but as the following chart proves, despite this decline, physician costs contribute a larger share of the total costs. According to James, the main reason for the reduction in costs is the physician utilization per claim. Even though it is only a3% reduction, it is significant, James says, in a time of upward spiraling medical costs. Chart 2 bears this out. The second part of my post yesterday, “Slight Increase in Average Medical Costs for Lost-Time Claims, Part 2”, looked at the steady rise of the average medical cost for lost-time claim. If we compare the chart from yesterday’s post to the one Mr. Lipton presented, we will see that his chart does show increases and decreases over time in the average medical costs per lost-time claim, but my chart indicates that ever since 1995, it has been rising steady. Both charts, do show that the average medical cost per lost-time claim is hovering around $30,000, and if the numbers are consistent with ones for earlier years, represents almost 60% of the total claims cost. To examine this in greater detail, Mr. Lipton broke down the Accident Years into three separate periods and slides, to show the change in medical cost per lost-time claim. He compared the change in Personal Health Care (PHC) Spending per Capita with the Medical Cost per Lost-Time Claim. In the period, 1995-2002, the average growth rate (AGR) for WC was 9%, and the AGR for PHC was 6%. In the next period, 2002-2009, WC AGR was 6%; PHC AGR was 5%, and finally, in the last period, 2009-2015, the WC AGR was 1%, while the PHC AGR was 3%, as seen in chart 4. To understand what was driving the decline in Accident Year 2015, Mr. Lipton identified six different drivers, as indicated in chart 5. Finally, Mr. Lipton discussed how hospital costs contributed to medical cost per lost-time claims by highlighting the difference between inpatient and outpatient costs, which are rising. The following chart looks at the four years prior to the 2016 Accident Year, 2012-2015. In 2012, Hospital Inpatient Paid per Stay amounted to $19,514, in 2013, it rose to $22,944 (18% increase), in 2014, it was $24,558, or a 7% increase, and last, in 2015, it was $25,320, or 3% increase over the previous year. As for Hospital Outpatient Paid per Visit, the number are considerably lower for each year when compared to Inpatient Stays, but nonetheless have been rising. So perhaps this, at the end is why the average medical cost per lost-time claim has been rising over a period of over twenty years, from 1995 to 2015. I wrote to James last night when I saw his recent posts on this presentation, and he responded that we are both correct in our analysis, but looking at it from different points of view. My conclusion after reading this presentation and my discussion with James suggests to me that there are two things going on here. One, when a worker is injured and receives medical care, unless and until he or she goes to a hospital, the best way to lower costs is through what James calls one of his six keys to reducing workers’ comp costs. One of those keys is medical control by the employer, which James said reduced cost by 75%. But I also realized that when an injured worker goes to the ER or an Ambulatory Service Center as an Outpatient, has an Inpatient stay, that this is where the medical costs go up. Naturally, Workers’ Comp medical spending is only a fraction of the overall health care spend of the US, and as costs for health care in general rise, so too does costs in workers’ comp. So, while many have argued or shown that they can lower costs on the front end, from time of injury to return to work for most claims where no surgery is required, one of the largest reasons for the steady rise in the average medical cost per lost-time claims is hospital costs. On this, both James and I agree. However, it is important that many in the industry see this as well. Keep thinking that it will change by doing this or that has not worked, the numbers prove that. Maybe it is time for something out of the box. This entry was posted in Average Medical Lost-Time Claim Severity, Claims, Domestic Medical Travel, Health Care, Health Care Costs, Hospital Fees, Hospitals, Injured workers, MEDICAL COSTS, Medical Provider Networks, Medical Tourism, Medical Travel, NCCI, physicians, Workers' Comp, Workers' Compensation and tagged Costs, Health Care, Health Care Costs, Hospitals, Lost-Time Claims, Medical Costs, Medical Tourism, Medical Travel, NCCI, Workers' Comp, Workers' Compensation on May 25, 2017 by Transforming Workers' Comp. Many of you have probably read my blog and notice that I sometimes refer to an organization called the National Council on Compensation Insurance or NCCI. Back in the mid 1990’s, I worked there briefly, and also did a stint with a software vendor company reporting data to NCCI and independent state bureaus for workers’ compensation claims and policy data. One of my blog readers told me about this year’s conference held in West Palm Beach and that we could me there. He came down from North Carolina yesterday, but left after the last class. Most of the classes were two hours long, with a fifteen minute break in between. The classes were given by two presenters who rotated during the sessions, so that you did not get just one person’s knowledge and experience. The participants ranged in age, but many were considerably younger than your humble writer. I had missed the 2oth anniversary reception Tuesday evening, but this was not really a social event, so it did not matter. The technology I saw displayed this week was a far cry from what I worked with back in the 90’s, and is all web-based and very easy to learn. My impression from the information presented in all classes was that NCCI is taking a more customer-friendly approach to workers’ comp data reporting, which was something I found lacking back in the 90’s. I know there are still areas of contention with some aspects of NCCI’s ratemaking role, as someone recently pointed out on LinkedIn regarding higher premiums for certain classification codes that are forcing small businesses out of business, but that is the exception and not the rule. Overall, I felt it was worth it to attend, and I have gained a better appreciation for data reporting. This entry was posted in Claims, Conferences, Insurance, NCCI, Workers' Comp, Workers' Compensation and tagged Claims, Data Reporting, NCCI, Policy Data, Statistical Reporting, Unit Statistical Reporting, Workers' Comp, Workers' Compensation on February 3, 2017 by Transforming Workers' Comp. Last year at this time, I wrote an article called, Average Medical Claim Costs Still Rising for Workers’ Compensation. It was based on the 2013 State of the Line Report from the National Council on Compensation Insurance (NCCI). While I was attending the Miami Beach Medical Travel Summit, NCCI released their 2014 State of the Line Report at their Annual Issues Symposium in Orlando. This year, the report was presented by the new Chief Actuary, Kathy Antonello. She replaces Dennis Mealy, who retired last year. The chart from the 2013 State of the Line Report, which appears below, indicated that the average medical cost for lost-time claims in 2012, was $28,500, and was a preliminary figure (based on data valued as of 12/31/2012). The revised figure for 2012 in this year’s report (see Chart 2), was $27,900, a slight decrease. However, the preliminary figure for the average medical cost for 2013 in this year’s report, was $28,800 (based on data valued as of 12/31/13), an increase of $300, which does not seem like much, but still a sign that costs are going up, not down, if only slightly. This year’s report showed that the Annual Change 1995―2012 was +6.7%. While the annual percentage change dropped from its high of 10.6% in 1999, the annual percentage change held the same from 2012 to 2013, at 3%. Yet, the trendlines in both charts shows that medical costs are still trending upwards. When I cited the State of the Line Reports in my White Paper and last year’s post, I was unable to determine if these figures included claims that had surgeries, because the figures seemed a little low for claims that had surgical procedures attached to them. However, this year, I contacted NCCI, and received a response today from Juan Restrepo, Research Consultant at NCCI in Boca Raton. He told me that the medical severity presented is derived from reported losses from all claims involving lost-time. Those losses and claims are subsequently developed to ultimate and serve as the basis for the aggregates presented. Medical-only losses are specifically excluded. The only added caveat is that the metric represents an aggregate for the states where NCCI provides ratemaking services (currently 37), including state funds and excludes WV. In addition, the data excludes high deductible policies, so the true cost of medical care is probably far higher than reported. To further illustrate the rising cost of medical care for workers’ comp, the Workers’ Compensation Research Institute (WCRI) released a study last month that stated that medical costs per claim for injured workers in Indiana were higher and rising faster than most in a 16-state study conducted by the WCRI. The study found that the main reason for higher medical payments per claim was higher and growing prices, as in other states with no price regulation. Lower to typical utilization, however, helped offset the higher prices paid. Yet, the cost for hospital care was an important factor in the higher overall costs per claim in Indiana, especially for outpatient services. These two issues were addressed in my post last year, Outpatient Facility Costs Rising Could Benefit Medical Tourism Industry and Rising Hospital Costs: What they mean for Workers’ Compensation and Medical Tourism from 2012. In Indiana, hospital payments were among the highest at nearly $12,000 per 2010 claim, evaluated in 2012. This was attributed to higher prices and inpatient payments. Overall, medical payments per workers’ compensation claim in Indiana grew 8% per year; on average, from 2006 to 2001, faster than in any other state. That medical costs in workers’ comp and health care in general are rising is not in doubt. What is in doubt is what to do to solve this problem. The workers’ compensation industry goes on about more cost containment strategies, more legislation and more regulation, and more attempts to reform a broken and dysfunctional system. An article in Insurance Journal by Andrea Wells discussing the 10 Challenges Ahead for Workers’ Compensation cited that technology and innovation was one of the challenges ahead for workers’ comp, and quoted Thomas Lynch, the founder and CEO of Lynch Ryan & Associates Inc., a management consulting firm for workers’ comp cost control, as well as publisher of the blog, WorkersCompInsider.com. According to Lynch, the health care industry has dwarfed any advancement that has been developed in the workers’ comp industry. He went on to add that the Property & Casualty (P/C) industry is very slow to innovate and lags behind other industries, including other parts of the insurance industry, and the workers’ comp industry is way behind and must catch up. While much of what Lynch had to say related to technology and innovation of that technology, the same can be said for other aspects of innovation that the health care industry is pursuing, such as medical tourism. The workers’ comp industry needs to seriously look at what it has done for decades and that has not worked, and then decide that the health care industry, particularly the medical tourism industry can offer an alternative to doing the same thing over and over again and expecting different results. Yes, it is difficult. Yes, there are barriers and obstacles. And yes, there are certifications and accreditations, and licensing and all the other legal roadblocks that have been erected to prevent other medical providers from handling workers’ comp claims, but when you stand back and look at the bigger picture and see that when one person injures themselves on the job and another is injured riding a horse, and both injure the same body part, the surgery is the same, the surgeon can even be the same, but one patient can only be treated if the physician has jumped through all the hoops required by workers comp, and the other can go ahead and treat the patient without going through those same hoops. Of course, the physician has to have a license to perform medicine, and what does it matter if he got trained at Harvard Medical School or trained in a well-known medical school in his home country or region? Is the teaching of medicine any different? Are American patients somehow different than Latin Americans, Asians, or Europeans? Or, is the reality that once the scalpel goes in, we are all the same and look the same when the blood starts flowing? Listening to the so-called “workers’ comp experts” one would have to say no, but I know otherwise. I don’t have all the answers, but like Robert Goddard, the father of modern rocketry, or the first person to say that it was possible to split the atom, I have the idea to do it. Neither men were there when we landed men on the moon or dropped the first atomic bomb on Hiroshima. Yet, Goddard and the man who thought it was possible to split the atom gave others, like Werner von Braun and Robert Oppenheimer, the idea that we could. Those feats were certainly more difficult and more perilous than opening up a man-made, medical-legal system to an alternative that offers lower cost and better quality health care. Or are we content to let working people suffer the indignity of a broken and dysfunctional system just to placate doctors, lawyers and other service providers? This entry was posted in Health Care Costs, Medical Tourism, Workers' Compensation and tagged Health Care Costs, Hospital Costs, Inpatient Costs, Medical Claim Costs, NCCI, Outpatient Costs, WCRI on May 14, 2014 by Transforming Workers' Comp. The National Council on Compensation Insurance (NCCI), the national reporting bureau for workers’ compensation data reported its 2013 State of the Line Report yesterday. Those of you who have read my White Paper on the implementation of medical tourism into workers’ compensation will recognize the chart below as similar to the one in my White Paper. The State of the Line report is given every year at the Annual Issues Symposium held in Orlando, Florida. This is the last year that the Chief Actuary, Dennis Mealy is giving the report, as he is retiring, according to Joe Paduda in his blog. The chart shows the years from 1991 to 2012, with the average medical costs per lost-time claims (any claim beyond the statutory waiting period and for which the claimant is receiving benefits). In addition, the chart shows the average percentage change between the previous years’ medical costs and the current years’ medical costs. As I mentioned in my paper, the trend still appears that medical costs are going up, even if the percentage change has gone down. The next chart highlights this trend for the average medical cost per lost-time claim. In each year’s report, the last year is a preliminary figure which is revised once all data is reported to NCCI. This is also true for other years, as the nature of workers’ compensation data reporting is to require insurance companies to report ten years’ worth of data to NCCI. As reported by Joe, average medical claim cost was up 3 percent from last year, as you will see in the chart. Yet despite the cautious optimism, the trend is for the average medical claim cost to get closer and closer to $30,000, and may yet surpass that amount in the next several years. While there is no way to tell if these figures include the cost of surgical procedures for lost-time claims, it is reasonable to assume that the total cost will be much higher. This is where medical tourism will benefit the workers’ compensation industry, because it can offer lower cost medical care at the same or better quality than that available in the US. Why the workers’ compensation industry continues to delude itself and its insured’s that costs are coming down is beyond me? But one thing is certain, they are not availing themselves of an option that offers tremendous cost savings and will provide the patient with faster recovery and quicker return to work — medical tourism. This entry was posted in Claims, Medical Tourism, Workers' Compensation and tagged Medical Claim Costs, Medical Tourism, NCCI, State of the Line, Workers' Compensation on May 16, 2013 by Transforming Workers' Comp.